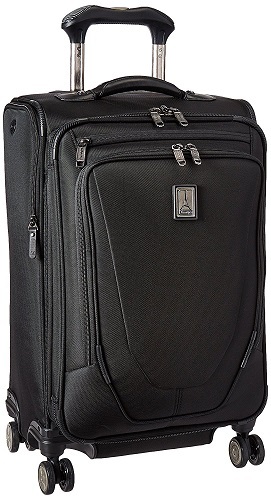 Founded in 1987, Travelpro quickly became one of the leading companies that make functional luggage. They managed to find their customers among flight crews and experienced globetrotters because their goal from the very start was to create unique products that will make traveling a lot easier for everyone. Their first innovation was the Rollaboard luggage made by a Northwest pilot who understood how important it was to have baggage that does not slow down your movement while you are trying to catch your flight. Their main factory is located in Boca Raton, Florida and the designers working there have been exploring groundbreaking designs that make hopping from one continent to another more convenient to their loyal users. Travelpro’s official website offers plenty information to their customers that will help them take care of their luggage properly. 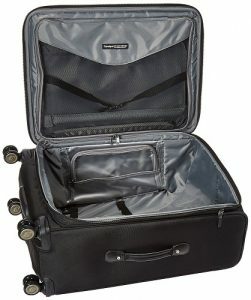 So if you want to find out how to clean your Travelpro bags, click on Luggage Care section. You can also register your bags and choose a warranty for each item. Travel Resources will tell you everything you need to know about the international travel and you can inform yourself about all the latest changes and updates. It is a useful list every traveler should go through before departing. If we manage to get you interested in this brand with our Travelpro Crew 11 3 piece set review, you can take a closer look at their range of products right there on the official website. They have all the details you need in order to travel the world safely and easily. Before we dive into Travelpro Crew 11 3 piece set review, we have to mention that Crew 11 series feature a wide range of luggage. While this 3 piece set will be enough for both business and casual travelers, some of these bags can come in handy in other situations. You can also get Deluxe Tote which is a handheld bag, Bi-Fold Garment Bag for clothes, Rolling Tote which is small and easy to maneuver, Spinner Tote that is a slightly larger version of the previously mentioned bag, Rolling Carry-On Garment Bag and a 50” Garment Bag. They all feature a similar design, same high-quality materials, and improved functionality. You can pick and choose the model that suits your lifestyle perfectly because Travelpro has exactly what you need. Travelpro’s Crew 11 luggage is created to make your travels more comfortable. This 3 piece set include a total of three suitcases – 21, 25, and 29. They all feature a clean design with a tiny Travelpro logo on the front. Each can be expanded if needed and you will get an extra two inches of depth. Black: You can’t go wrong with the black color. It is a classic choice for both male and female travelers. While it might not be the flashiest option out there, it is elegant and functional. 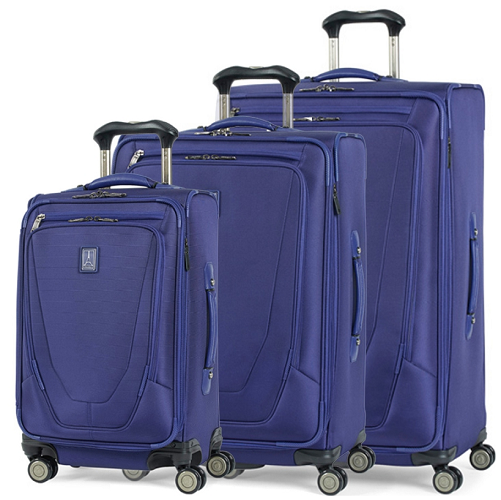 Blue: If you want to add a touch of uniqueness to your luggage collection, you can choose Travelpro Crew 11 3 piece set in this rich blue color. It will make your bags stand out everywhere. This shade of blue is fresh and classy at the same time. Since you will get three bags in this set, it is important to mention that the overall design stays the same but you will get more storage with each piece of luggage. The Overall Style and Design of Travelpro Crew 11 3 piece set gets 4 out of 5 stars. The design is classic and timeless. The construction is impeccable and every traveler will love the fact that this luggage is simple and elegant. Since you will receive three suitcases in this set, you will have plenty of options when traveling. The only changes we would make would be to offer more variety in color choices. Crew 11 luggage excels when it comes to comfort. You can push it around smoothly because the wheels roll easily on most surfaces. The wheels can spin 360 degrees and they are coated with MagnaTrac. The PowerScope handle has a secure leather grip that will be very comfortable for your hand. You can also adjust the length in order to fit your height so you don’t have to struggle while pushing the luggage beside you. Each and every bag in this set features plenty of pockets that will make organizing a lot easier. You will also notice that they have a suiter that is perfect for storing more expensive clothes that are supposed to be ready to wear as soon as you reach your destination. The mesh pocket is perfect for separating your cosmetics from the clothes, while wet pocket can hold your used clothes and keep it away from the clean items. The interior is synthetic and it is the best material for cleaning and maintaining. Each bag has an external USB cable that can be connected with a power bank. 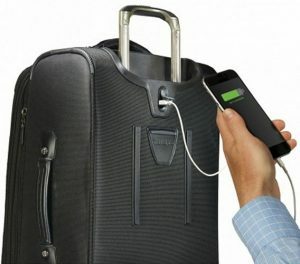 So if you need a quick and convenient way to recharge your phone, you can do so with your own luggage. This really is a quirky detail that will make a difference when you are waiting for your next flight and your phone is about to shut off. The Overall Comfort of Travelpro’s Crew 11 truly deserves the highest mark so they will get 5 out of 5 stars. 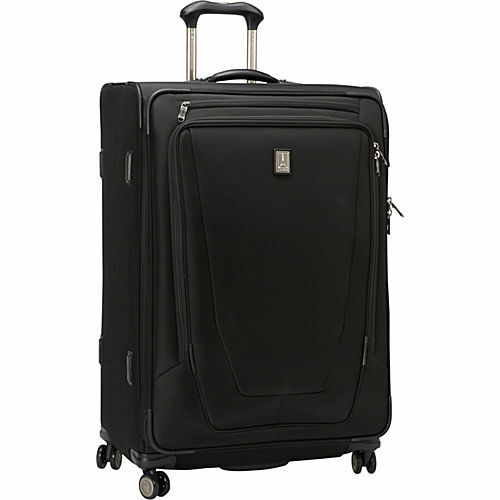 The wheels are incredible and will make your luggage glide through an airport smoothly. The adjustable handle is comfortable and secure. Organizing and packing your clothes will feel like a breeze because you have enough compartments and pockets to know exactly where each and every item is. Travelpro is known for making luggage that can last for decades and they included their latest innovations in Crew 11 suitcases. 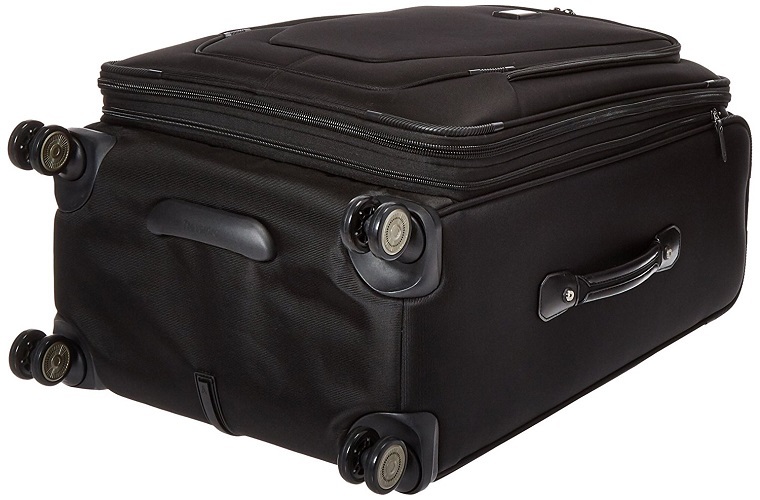 This luggage is incredibly light but it can be used often without worrying you might damage it. Each piece of luggage included in this set is made of ballistic nylon that is fortified with DuraGuard coating that guarantees longevity. The key points such as corners are molded for even more protection. If you are wondering why these suitcases are so easy to carry, the answer is honeycomb frame that is both strong but weighs next to nothing. Travelpro offers Limited Lifetime Warranty if you register your bags on their website. This means that if there is any issue with your luggage, they will fix it or replace the suitcase in question quickly. All you need to do is contact their customer service and explain the problem. The Overall Durability of Travelpro’s Crew 11 3 piece set deserves 5 out of 5 stars. Even though the combination of the materials pretty much guarantee that your luggage will not be damaged while you are on the move, the Limited Lifetime Warranty will not cover absolutely every accident you might have out there. 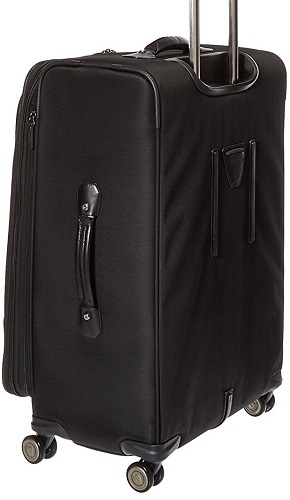 But we also have to mention that we adore how light but sturdy these suitcases are. Leather handles on both top and the side. A PowerScope handle that is comfortable and has several stops. MagnaTrac system which will keep your luggage moving straight with the help of magnets. High-quality and reliable ballistic nylon fabric coated with Duraguard. Each bag can be expanded for up to 2 inches. External USB port that can be connected with your power bank. Large lid pocket on the inside. Supra zippers that are very durable and can withhold constant use. Mesh pocket for smaller items. Inside straps to keep your items in place. Limited Lifetime Warranty on each bag. As you can see, the list of features goes on and on. Travelpro luggage is really one of a kind because they are dedicated to their goal of delivering their users with the most comfortable way to carry their things as they travel around. These suitcases are perfect for any kind of traveler and this Travelpro Crew 11 review proves that having this 3 piece set could be very useful. The Overall Functionality of the Travelpro’s Crew 11 3 piece set deserves 5 out of 5 stars. Each addition is practical and you will enjoy carrying these bags on both weekend getaways and long vacations. We have gone through every little detail this luggage set has to offer so it is the perfect time to make an assessment if Crew 11 suitcases are worth the money. While the price tag might seem a bit high at first, keep in mind that you will get three separate bags that will give you more storage options when traveling. 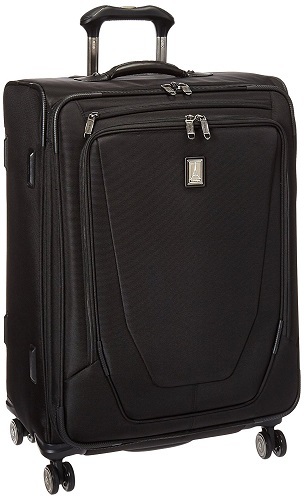 Travelpro Crew 11 luggage is not only easy to maneuver, but also quite comfortable and extremely durable. You can be certain that these bags will last you for years to come so it is a smart investment. It is clear that Travelpro is still at the top of their game and their luggage is one of the best in the market. This Travelpro Crew 11 3 piece set is absolutely worth the money, especially if you tend to travel a lot. The wheels – The wheels use MagnaTrac technology which will keep them moving in a straight direction but you can quickly rotate them if needed. 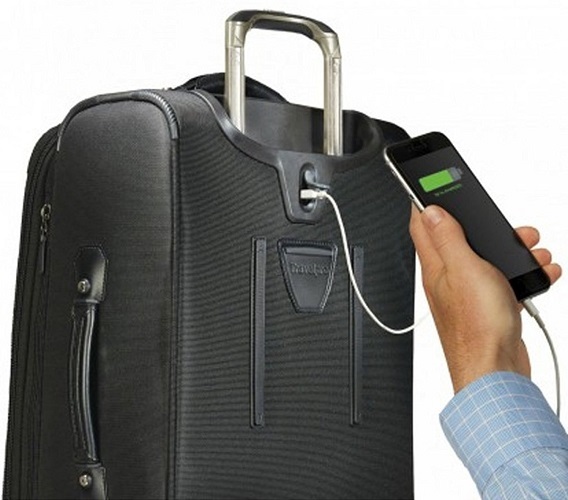 So these suitcases are very mobile and will glide over any surface without any problems. Durable materials and adjustability – The nylon materials which can be found on both inside and outside feel very durable and high-quality. You can also expand each suitcase if you require more internal space. Plus, the handle will definitely fit your height because it can be adjusted as well. External USB port – Perfect for people who are constantly on the move, this USB port will allow you recharge your gadgets in a very convenient way. It is a clever feature and all you need is an external battery. Of course, each Travelpro Crew 11 bag has a special pocket that will keep your power bank in place and within your reach. Three pieces of luggage – You can solve all of your luggage issues with a single purchase. 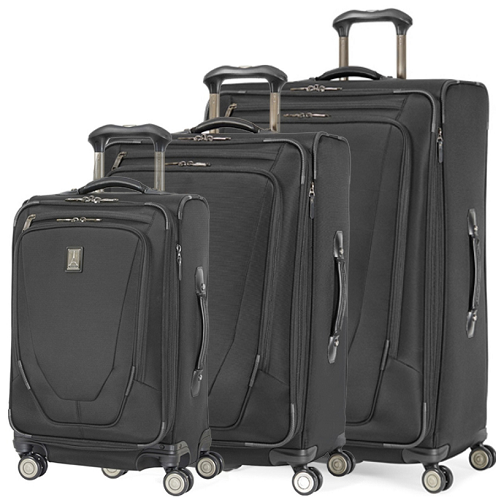 This set includes three differently sized Crew 11 suitcases: 21, 25, and 29. This means that you can pick and choose the bag that would fit you depending on your needs at a moment. Crew 11 21 is a carry-on bag that will be accepted by the majority of domestic and international airlines. Lifetime Warranty – In the event you find yourself with an expensive piece of luggage that is not usable, Travelpro made sure to include a lifetime warranty on their products that cover workmanship and manufacturing. The price is a bit high – Not everyone can afford this 3 piece set because the price tag is definitely steep. The price does include three suitcases but it still cannot fit anyone’s budget. The lack of color variety – Travelpro Crew 11 3 piece set comes in two colors only – black and blue. While these shades are universal and elegant, this might disappoint some of you who want colorful luggage. Travelpro Crew 11 3 piece set can become your best friend on your journeys. It is made for every globetrotter out there because this particular set has three different suitcases that will allow you to take everything you need with you and have enough room for souvenirs from distant countries. The premium materials, lightweight build, and 360 wheels will allow you to push your luggage effortlessly anywhere you go. This luggage set is exceptional and will be very valuable if you love traveling. The Overall Rating of the Travelpro Crew 11 3 piece set is 4 out of 5 stars!